Obsessed Much is the fanlisting collective for Meiran, Cyn, and Shoka. Please browse around and join some of our listings! We have listings in several different categories and we're sure you're bound to find something in here you like. January 21, 2010 -- The site messed up, so we reverted back to a rather old version of the front page, which is why the updates below this are so old. June 8, 2005 -- Did a new layout for the site! 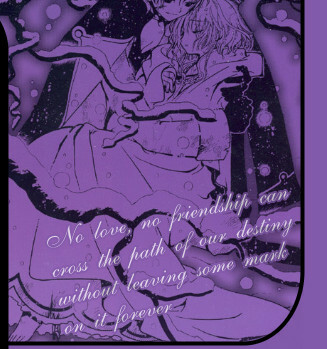 This one features Sakura and Syoaran from Tsubasa Reservoir Chronicle. And it's my favorite color. For FL news, I(Cyn) have adopted out Alexei, Lirael, Kiss the Girls, and Winchestery Mystery House. Also switched the Gabriel Bowman fl over to Shoka, so she'll be taking care of that one from now on. I'll have their new urls up at the old address once they move. Meiran has also adopted out a fanlisting or two, but I can't remember which ones. I think I need to implement the blogger here again. Will work on that today if I have time. May 26, 2005 -- All the buttons for all the fl's are done. Added the last updated date for the fl's to the owned sections. Cyn has removed some of her fanlistings that have been adopted out or closed. May try to add a list of those to the site later. Updated the above fanlisting numbers to reflect those changes. February 24, 2005 -- Woohoo! All the fanlistings owned by Cyn, Meiran, and Shoka have been converted over to Enth and are currently listed on this site. There is one exception, I didn't do one that Meiran plans on putting up for adoption. Not all of them have snazzy buttons yet, but hopefully I'll feel like getting them done soon. December 3, 2004 -- Okay, I'm going to go ahead and put the site up, which you've probably already figured out. *smile* It is not finished, so please bear with any of the weird things you might see. For one, not all of our fanlistings are switched over yet. Also, most of Meiran's fanlistings currently don't have the right size button for the owned page, so that makes it look weird. I am working on getting everything fixed up and all the fanlistings switched over, but it takes time. Also, we don't have Shoka switched over at all yet. So look for hers to be included some time in the future. Thanks!